Melanocytes are cells that produce skin pigment or color. Sometimes, these cells clump together and form what are known as moles or nevi. The majority of people have a minimum of ten moles located on their bodies. Moles can be classified as either common or abnormal. Common moles will all be the same color. They can be brown, black, tan, pink, red, blue, skin colored or even have no color. Other characteristics of common moles include a rounded shape and a flat or slightly raised look. Their appearance does not change from one month to the next. On the other hand, melanocytes can form abnormal moles, known as dysplastic nevi or atypical moles. Where some patients might have one or two atypical moles, others can have in excess of one hundred. While these moles are not actually malignant (cancerous), their presence can be a warning signal of the inherited tendency (familial predisposition) to get the more serious form of skin cancer known as melanoma. Dysplastic nevi are most often found on a person’s back. However, they can form anywhere, including on the scalp or under the waist area. They can also be found on the buttocks or breasts. These moles can blend into the skin surrounding them and have a flat area that is level with the skin surface. An atypical mole may appear smooth, somewhat scaly, and possess an irregular, rough “pebbly” look. A dysplastic nevus can be larger than a common mole. Its border, color and surface may be different than a normal mole. Generally, it will be at least five millimeters across. Abnormal moles are generally not seen in newborns. Rather than being congenital, dysplastic nevi are usually acquired sometime later in a person’s life. The majority of dysplastic nevi do not become melanoma. Instead, they tend to remain the same over time. Dermatology experts estimate that the possibility of melanoma developing from atypical moles is approximately ten times greater in an individual with four to five dysplastic nevi than in someone with none. 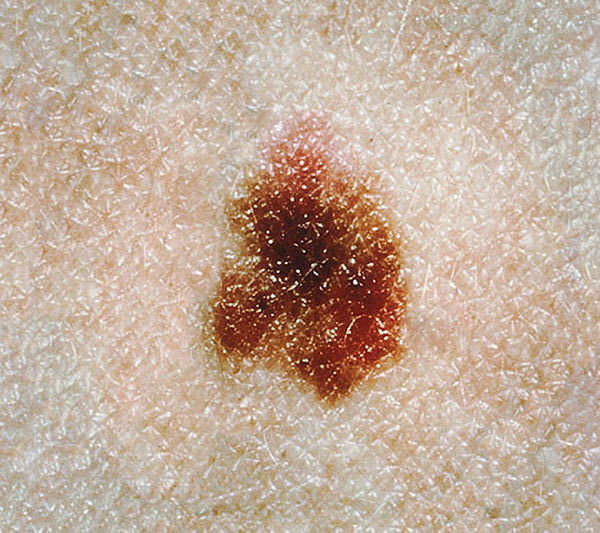 The more atypical moles a patient has on his or her body, the greater the chances are that the patient eventually develops melanoma. Your dysplastic nevi may develop into melanoma if you have had skin cancer in the past or if an immediate family member has had melanoma. Some patients who have a great number of atypical or abnormal moles have a condition known as familial atypical multiple mole melanoma syndrome (FAMMM). Anyone with FAMMM syndrome typically has in excess of fifty moles. Some of these moles will be the dysplastic (atypical) variety. These patients often have a close family member with a history of melanoma. Everyone needs to protect their skin from the harmful ultraviolet rays of the sun. You need to refrain from using both sunlamps and dangerous tanning booths. These preventative measures are especially critical for people who already have dysplastic nevi. If you have atypical moles or FAMMM, it is even more important to not get a sunburn or tan and to appropriately protect your skin. The majority of dermatologists strongly recommend that patients, who have dysplastic nevi, examine their skin closely for any changes monthly. Also, inform your doctor if you notice any changes in the following characteristics of an atypical mole.